The Mormons named the tree for the Biblical figure Joshua, or so the story goes. Joshua, who played somewhat of an Assistant to the General Manager, that being Moses, raised his hands skyward to the Lord in the good old days. 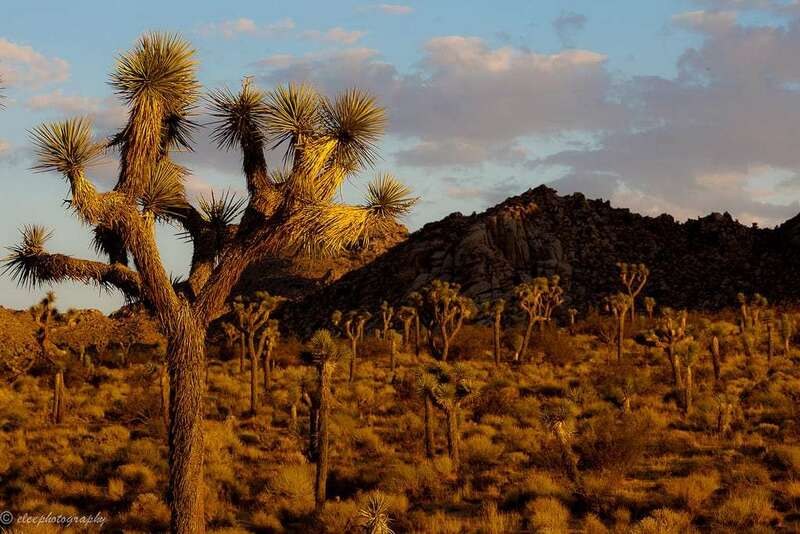 Subsequently, when continent-crossing Mormons reached the southwestern corner of the nation, they came across these tree-sized yuccas reaching with their long sharp leaves to the sky and figured they must be the plant reincarnate of the Old Testament wise-man. Their leaves tend to be described as massive daggers more often these days than praying hands, but whether a metaphor for war or a holy man, the trees are impressive in their unusualness. 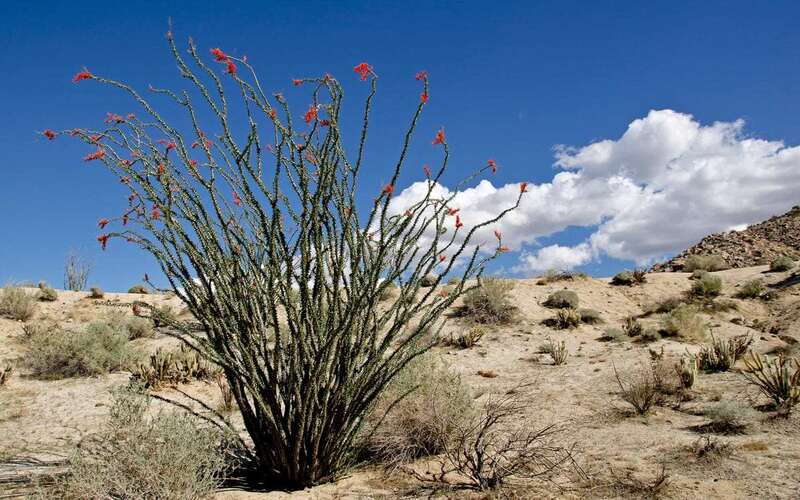 As a yucca, living of their own accord somewhere between desert cacti and forest tree, the beauty comes as much from their unusualness as it does their physical appearance. Standing in troves on hillsides and valleys as we cross the Mojave, they disappear at times and then show up a few towns later as though they know some backroad shortcut. Like a real cowboy, they look best in silhouette at sunset, or under the haze of a thick desert heat. 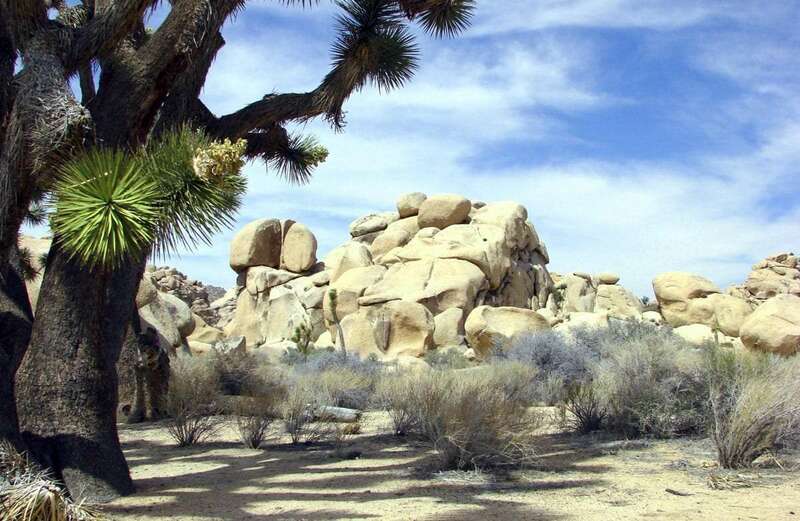 A forest of Joshua trees in Joshua Tree National Park. Photo by Esther Lee. 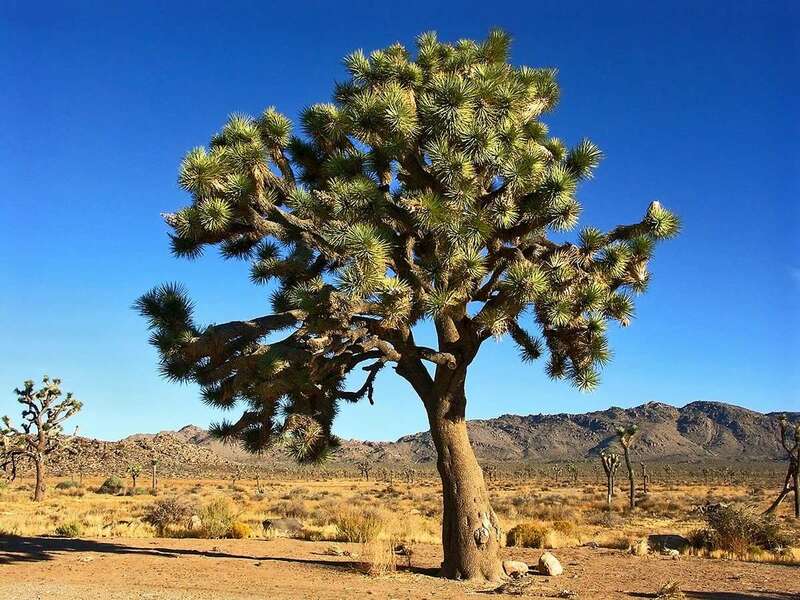 Joshua trees are endemic to the American Southwest, meaning they grow naturally only in California, Arizona, Nevada and Utah. Photograph by Dan Eckert. The Coachella Valley, just near Joshua Tree National Park. Photo by Eric Bryan. One of the Joshua trees neighbors, the ocotillo looks like a grey, dead bush most of the year, until it bursts into red flowers in bloom. 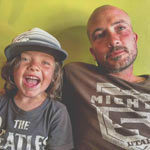 Photo by Scrubhiker. 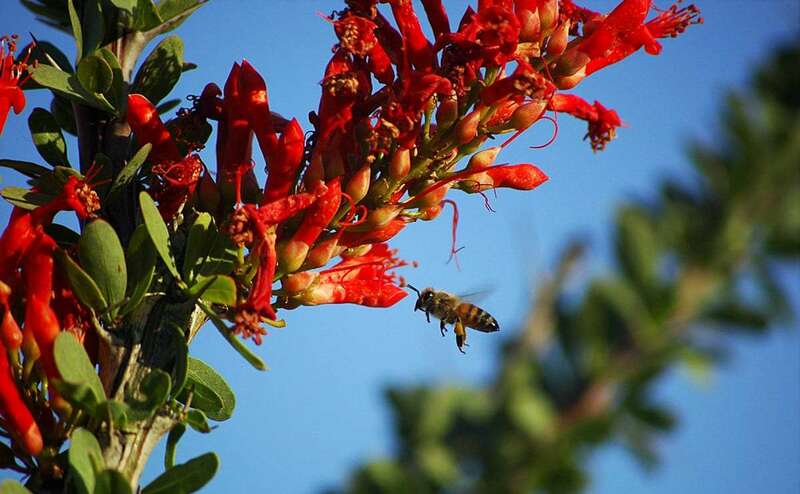 Ocotillo flowers and a desert honey bee. Photo by Jim Staley. 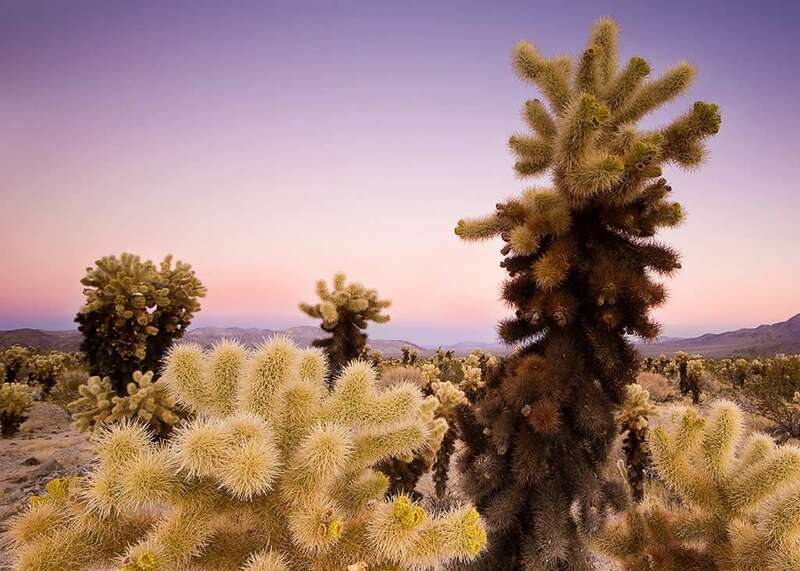 Cholla cacti are another unusual and beautiful neighbor of the Joshua tree. Photo by Eric Bryan. Though it’s rare to find them as far west as California, the Saguaro cactus can live in the same region, such as the Whipple Mountains. 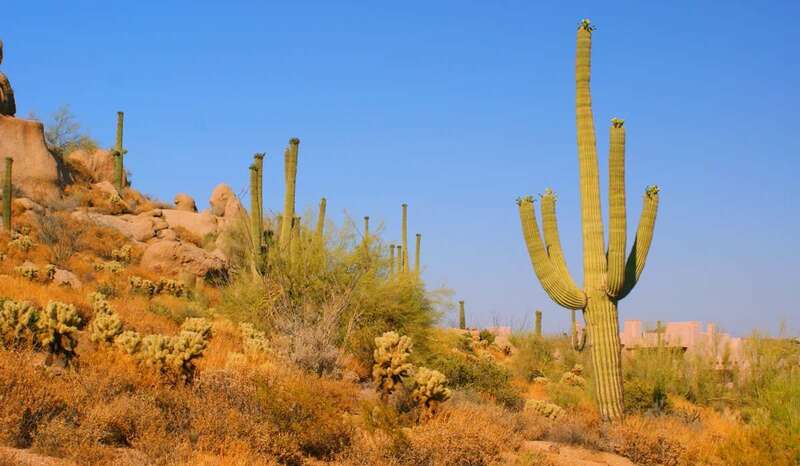 Saguaro are the most iconic yet least widespread of the cacti. Photo by Daniel Spiess. 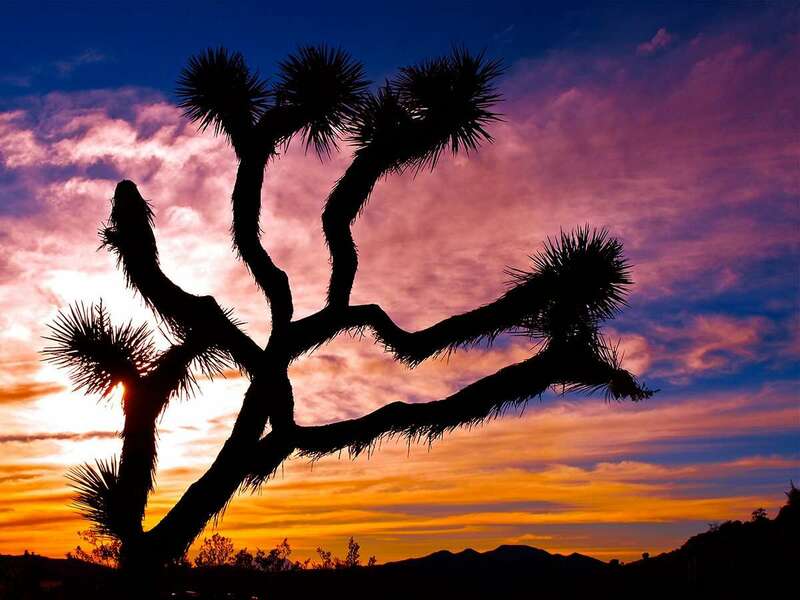 A Joshua tree casts rare shade over the desert. Photo by Don Graham. 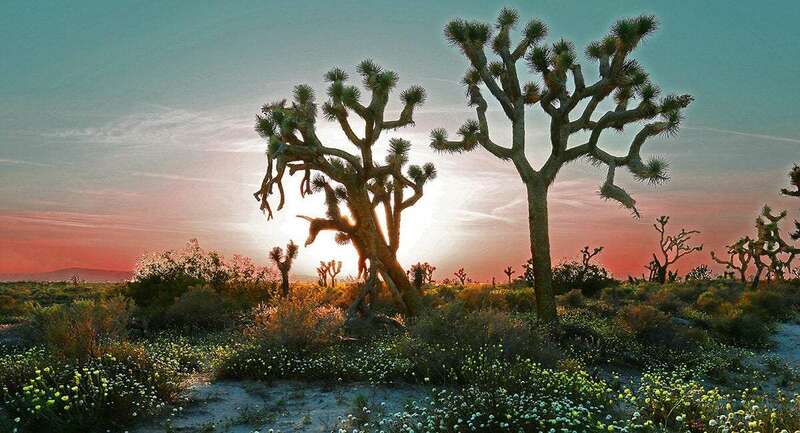 Given adequate rain, Joshua trees bloom from February to April, springtime in the desert. Photo by Bryan Ungard. 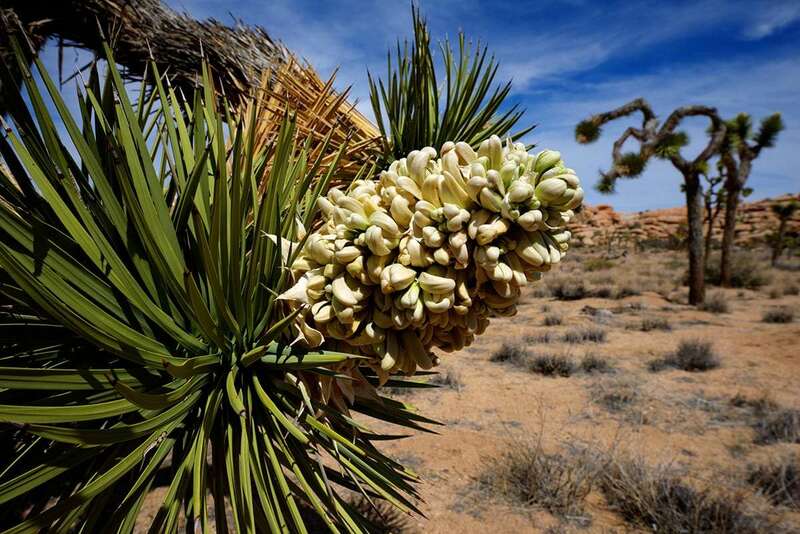 Joshua trees and yucca moths, seen here, are forever bound to one another. 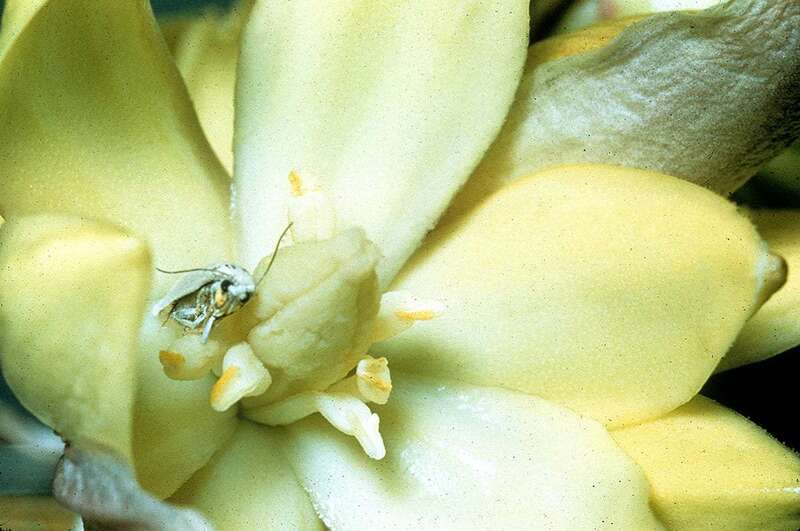 Yucca moths pollinate the trees, and in turn the trees provide the seeds the moth larvae need to survive. Photo courtesy of the National Park Service. 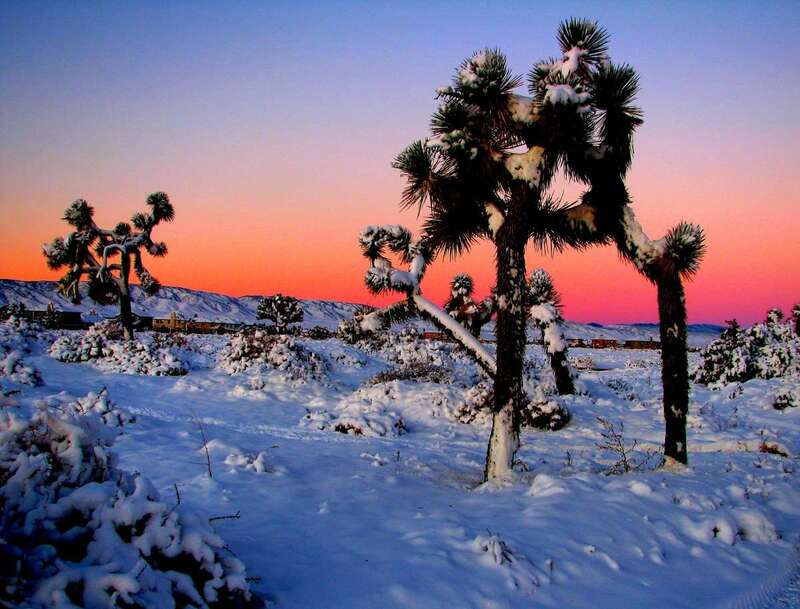 Record levels of snow fell in Yucca Valley in 2008, blanketing Joshua trees in snow. Photograph by Rennett Stowe. 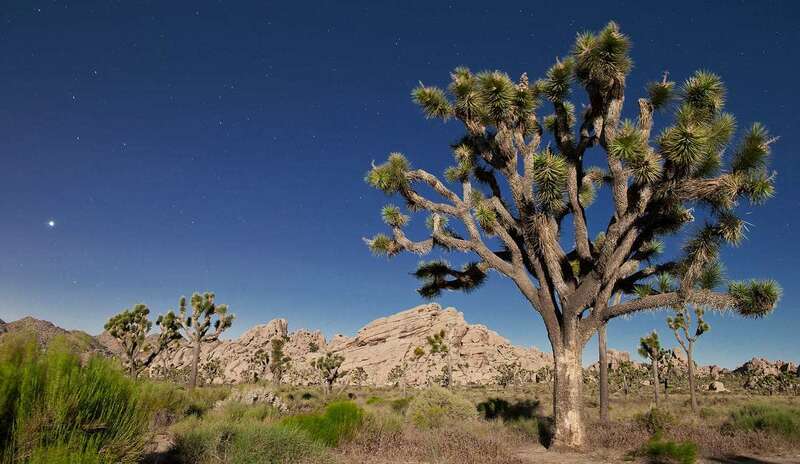 Joshua trees trunks are fibrous and don’t create tree rings, so aging them can be next to impossible, though they’re thought to live as long as 1,000 years. Photograph by Graham. A near perfectly crowned specimen in Joshua Tree National Park. Photo by Tobias.